For those that love the thought of a 5.3″ Android smartphone like the Samsung Galaxy Note but don’t want to wait for it to hit AT&T or pay the outrageous price the international version is selling for, BLU Studio has you covered. Available now is their Note-challenging 5.3″ Android 2.3 Gingerbread powered smartphone with a huge 2,500 mAh battery. The rest of the specs might not match the Note — but the price doesn’t either. Wo don’t know a whole lot about this phone or BLU but they’ve released a few phones in the past. The BLU 5.3″ is nothing compared to the Galaxy Note other than it has the same size screen and battery. The BLUE comes with a single-core 800 MHz processor, 512MB of RAM, 8GB internal storage, Micro-SD slot and a 5 megapixel camera on the rear. They do offer that huge 2,500 mAh battery and a VGA front camera too, but that is where the good news ends. The 5.3″ capacitive touch display is only 800 x 480 so resolution isn’t a strong point here either. This smartphone is available today from the popular online retailer Expansys-USA and will run you only $259 with free shipping. 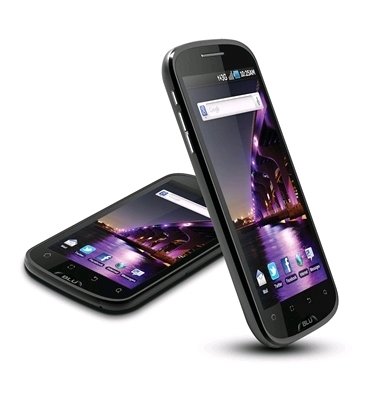 Its a GSM unlocked smartphone with support for dual-sim cards. This smartphone tablet hybrid runs on Android 2.3 Gingerbread but that is all we know. The press images seem to show some HTC Sense UI style icons but that is about it. Head down to the source link if this interests you but proceed with caution as we don’t know much about this India-made smartphone.